A significant change in Sri Lanka’s power generation industry is the country which has been largely dependent on hydro power, is that it is now increasingly turning to thermal power generation such as diesel fuelled power-in 1986, 99.6% country’s electricity needs were met by hydro power. However, by 2008/9, it fell considerably to 50%! Variations in seasonal rains, drought and increasing demand have contributed to the change in energy mix that goes into the national grid. Under pressure by the demand-supply gap, private sector power suppliers were allowed to supply power to CEB from 1996 and at present, their participation has increased to almost one third of the total installed capacity in the country. However, the shortfall in demand/supply continued and future power demand forecasts began painting an increasingly gloomy picture. Whatever the disadvantages of coal use, in the immediate future, Sri Lanka appears to have no viable alternatives other than coal based thermal power-and that too, will be needed in increasing measure. According to CEB’s long-term power generation plans, in future, more than 88% of the country’s energy mix will be spearheaded by coal-the main reason being that Sri Lanka has exhausted most of its hydro electricity reserves and their potential. Sri Lanka plans to reduce dependence on hydroelectricity to a mere 20% by 2022. Based on the ‘coal’ idea, two coal power plants were envisaged thereafter- Norochcholai Coal Power Plant (NCPP) and Trincomalee Coal Power Plant (TCPP). The NCPP is Sri Lanka’s first ever coal power plant and has moved beyond planning stage. NCPP construction work began in 2006. 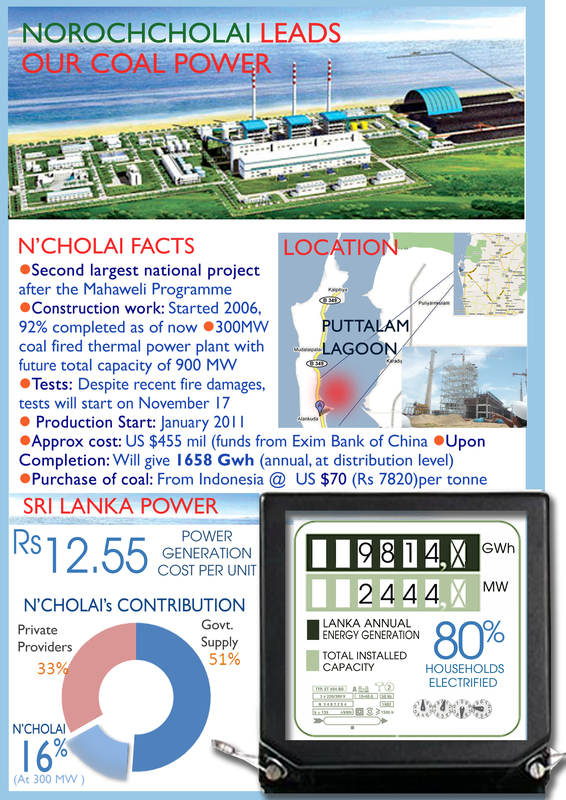 NCPP’s significance is not only its role in power generation-it’s the second largest national project after the Mahaweli Programme. NCPP’s approximate cost is US $455 mil and funds came from Exim Bank of China. Upon completion, NCPP will add a volume of 1658 Gwh annually (at distribution levels) to the national grid. NCPP will produce 300MW of power annually in Stage I and in Stage II, 600 MWs (2 x 300MW). The 300MW is about 17% of the power demand. Tests for Stage I will be commissioned in November as scheduled and production of first 300 MW for the national grid will kick off in 2011 January while Stage II is expected to be commissioned in 2012. NCPP now stands 92% completed. Despite the recent fire damages, tests will start on November 17-and production will commence in January 2011. The main challenge for N’choali may not lie in the environmental domain since clean coal strategies are now being developed globally. The fact that Power Minister (under whose domain NCPP falls) is also an environmentalist, and the fact that Sri Lanka is a low emission level country, suggest that thermal coal is not a huge worry for us. However the issues are likely to be on coal prices and supply. Despite the globally ‘great’ declarations of enough supply of coal for the whole world for the next 120 years, and the fall in global coal prices, coal supply will be a crucial fact for Sri Lanka’s future power sector. It is projected that by 2020, global coal demand will outstrip supply (2020 Supply at 7542 metric tonnes, while projected demand at 7709m Mts). Therefore, Sri Lanka will have to compete to receive its vital coal requirements. International coal prices are presently at low levels compared to 2008 August’s high-but the fall to current price levels are more to do with the recent global recession rather than any abundance in coal supply. Therefore there is no guarantee that we will have low coal import bills! More importantly, Sri Lanka will have to contend with the additional chore of coal shipment import logistics since coal is not mined within the country -thereby hitting us with an extra burden unlike many other global coal consumer markets who mine their own coal. Finally, coal is, by its very definition, a ‘dirty business’. If not managed well, health and environment hazards await the coal user. Then why we still go for coal power? This statement is also a clear indication of the reality of the cost constraints in our power sector. With the recent estimate of the annual increase in country’s demand for power at 8% mark, the high production cost scenario itself is grim and substantiates that ‘electricity power crisis’ will be an ongoing conflict for Sri Lanka. It is here that N’Cholai becomes a crucial experiment-an experiment so vital that the success/failure of its ‘real coal fires’ will be a decisive factor for many macro national policies of post war Sri Lanka.